Manual Draw – You can select any player’s score/handicap to use as the ghost’s score. Blind Draw – League Manager randomly selects a player’s score/handicap to use as the ghost’s score. Missing Partner – Ghost shoots the score/handicap of the partner that showed up. Player’s average – Ghost shoots the missing player’s average score and average handicap. Average can be based on any number of events or range of events. League’s average – Ghost shoots the league’s average score and average handicap. Average can be based on just the current events scores, or any number/range of past events. You can also select to include ALL golfers or just those in a particular flight(s) for inclusion in calculating the league average. 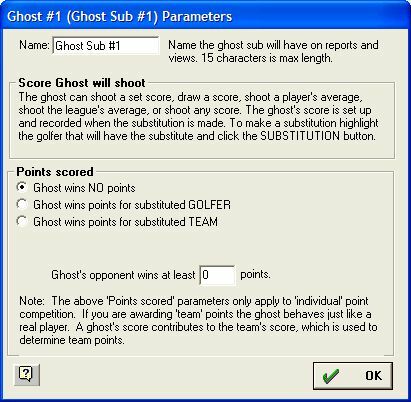 Any value – To cover ANY “exception to the rule” you always have the option to type in a score and handicap for a ghost right on the scorecard. Most leagues have only one type of ghost, but the option is there for up to five different kinds of ghosts. Once ghost parameters are set they should remain the same throughout the season! Note: A ghost can substitute any number of times. To change the Ghost’s name or how it distributes points, double click on the ghost or highlight the “GHOST SUB #” player, and click the Edit Player button. “Ghost can only win a maximum of X points” If you have a maximum number of points the Ghost can win, type that here...otherwise if there is no maximum set it to 99 (Ghost can win any number of points). “Ghost’s opponent wins at least X points”. This option lets the ghost’s opponent win at least X points. Ghost’s opponent wins a minimum of 4 points. Post the score for the current event. Move back to the past event. Enter the score for the past event. Most leagues do not let this score (which has been entered twice) count towards the handicap. To remedy the problem you must override\lock the “No show’s” scorecard (for this event). You want to remove the adjusted gross score, which is used to calculate a handicap. Pull up the “Player Information” form. Enter and lock the adjusted gross score to 0. The score will not be considered for handicapping. Note: The major problems with “make ups” is that the event standings are not final until all score cards have been posted for that event. If for any reason you need to alter the scores and points determined by the scorecard, League Manager gives you the capability to override these values. Pull up the “Player Information” form by double clicking on the player or ighlight the player and click the Edit Player button. Type the Gross Score, Adjusted score, Points, pars, birdies, eagles, and putts you want the player to receive. The player’s scores and points will appear in RED to indicate that you have overridden the points and scores calculated by the scorecard. Remember: If you mark “Lock Scorecard”...scores entered on the Scorecard will be ignored and only scores and points entered on the player form will be used. Pull up the “Team Information” form by double clicking on the team or highlight the team and click the Edit Team button. Mark “Lock Team Points”. Click with the mouse. Type the points you want this team to receive for the current event. The team points will appear in red to indicate that you have overridden the points calculated by the score card. Remember: If you mark “Lock Team Points”...team points calculated on the Scorecard will be ignored and only points entered on the team form will be used.